The Econo Lodge hotel is perfectly located on the west coast of central Florida, near the Gulf of Mexico. 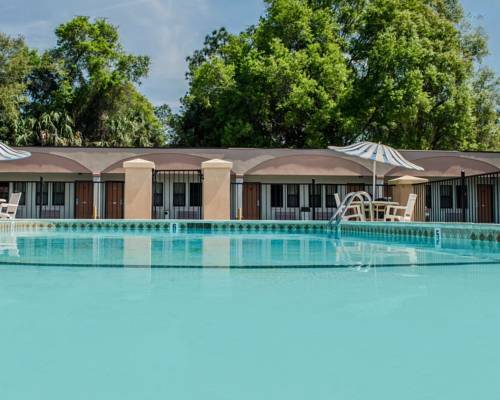 This Crystal River hotel is close to area attractions, including Homosassa Springs Wildlife State Park, Weeki Wachee Springs and the Ted Williams Museum. Guests of this Crystal River hotel are invited to enjoy many amenities, including free continental breakfast, free local calls, free coffee in the lobby and outdoor pool. Business travelers will appreciate access to fax and copy services. Guest laundry facilities and refrigerator rentals are available. Pets are welcome with a deposit and small stay fee. Pet accommodation: 10.00/night, limit 2 per room under 30lbs. ~54 miles from Crystal River. ~61 miles from Crystal River. ~59 miles from Crystal River.